Are you ready to work with a Virtual Assistant? If you’ve never worked with a Virtual Assistant before then you may be wondering how it all works. It’s actually very simple – you decide which tasks you want to hand over and pass me the information so that I can complete it – much like outsourcing to an accountant or a web designer, I’m specifically trained and have the skills for dealing with your admin. Do I ever feel annoyed that I haven’t achieved enough at the end of the day or week? Is there so much on my to-do list that I just don’t know where to turn? Am I feeling tired, overworked, stressed and like I need to regain control of that elusive work/life balance? Could you achieve more if you had an assistant? If the answer to one, any or all of those questions is “yes” then you are ready to work with a Virtual Assistant. A good Virtual Assistant will quickly become an important and vital part of your business so it’s really important to work with someone that you get along with on a personal level. A Virtual Assistant will understand your concerns, want to understand your business goals and work with you to achieve them. They will be knowledgeable, willing to learn and adapt, be proactive but above all, trustworthy. You will need to be ready to let go, willing to invest a small amount of time in getting set up and stay in touch! You’ll need to be clear on the tasks you are delegating and know what it is you want to achieve. Pass on as much information as possible – you may think some of it is irrelevant but if your Virtual Assistant sees the bigger picture, they may be able to offer other ideas or improvements that you haven’t thought of. It’s very much a two-way business relationship – interaction and communication are a vital part of it being successful for both you and the Virtual Assistant. 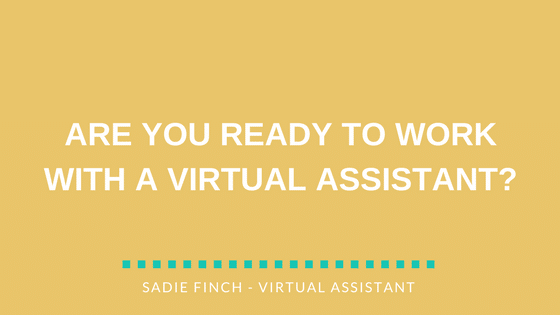 Ready to work with a Virtual Assistant? Great, just click here to get in touch! I look forward to hearing from you.